with P. & D. Colnaghi, 1951, where acquired by the present owner. G. Knox, 18th Venetian Art in Canadian Collections, exhib. cat., Vancouver, Art Gallery, and elsewhere, 1989, under no. 52. 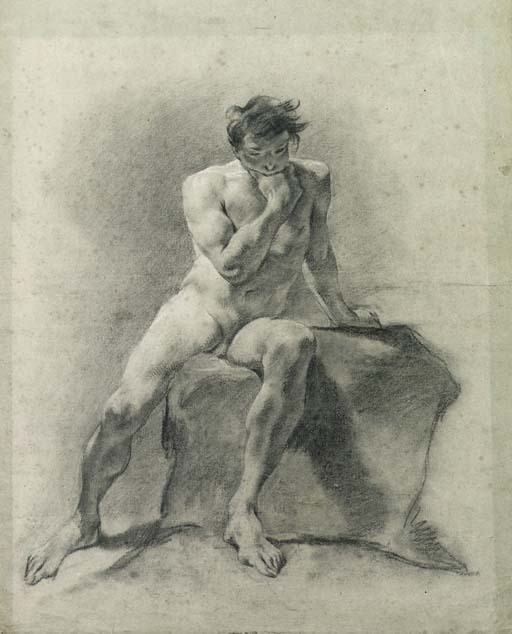 Professor Bernard Aikema has kindly confirmed the attribution to Piazzetta and dates the sheet to 1715-20, linking it with a group of studies of nudes in the Alverà collection, G. Knox ed., G.B.Piazzetta: Disegni, incisioni, libri, manoscritti, exhib. cat., Venice, Cini Foundation, 1983, nos. 11-15. This sheet is one of a group of seven academic studies, all of the same size and technique, sold by Dr. Nott to Colnaghi's in 1951. The others were bought by the Ashmolean Museum, Oxford (K.T. Parker, Catalogue of the Collection of Drawings in the Ashmolean Museum, Oxford, 1956, II, p. 519, no. 1035, pl. CCXXV), The National Gallery of Canada, Ottawa, (G. Knox, 1989, op. cit., no. 52), the Wadsworth Atheneum, Hartford (inv. 1951.266, bought through Charles Cunningham), Henry Tracey Kneeland (also bought through Cunningham, and later given to the Detroit Institute of Arts, G. Knox, Piazzetta: A Tercentenary Exhibition of Drawings, Prints and Books, Washington, National Gallery of Art, 1983, no. 1), Robert and Berta Suida-Manning (offered at Christie's New York, 12 January 1988, lot 34), and Mrs. Sally Byrne.